Tag Archive | "Dario Botia Loach"
The Dario Botia Loach (Botia dario) is found throughout much of the middle to lower Ganges and Brahmaputra river drainages in northern India, Bangladesh and Bhutan. Botia dario are collected wild from the rolling mountain streams of Bangladesh, situated just south of the Himalayas. The area is criss-crossed with clear mountain streams that feed three main rivers. The Dario Botia Loach also goes by the names Bengal Loach, Queen Loach, Scarf Botia, Geto Loach, and Indian Loach. The body of the Dario Botia Loach is tan and black in color, and like other Botia loaches can be identified by their four pairs of barbels protruding from the mouth area. The entire body and fins of this Loach is barred with alternating stripes of both tan and black, which gives the fish its unique look. The Dario Botia Loach is an active, semi-aggressive, social, bottom dwelling scavenger that enjoys the company of its own species and other semi-aggressive fish. Like some other Loaches, they frequently school with others of their own species, size, and age and in the aquarium should be kept in groups of 4 to 8 fish. , nooks, and tight crannies, especially when they sleep. They are reclusive during the day and become most active towards dusk. Dario Botia Loaches will squeeze themselves into any tiny gaps or crevices they can find, so items with sharp edges should not be placed in the tank. Any gaps or holes that are small enough for the fish to become trapped in should be filled in with aquarium silicone sealant. Because they are jumpers, a tight fitting cover is a must for these loaches. 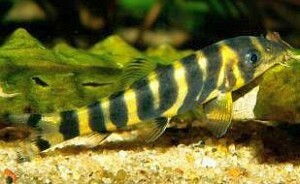 Dario Botia Loaches come from streams and require currents in the aquarium. They are intolerant to accumulations of organic wastes and need spotlessly clean water to thrive. A good filtering system and a small power head will achieve the desired well oxygenated water and moderate current conditions they require. Since Dario Botias are subject to low light conditions in their native habitat, lighting in the aquarium should be relatively subdued. Plants like Microsorum pteropus (Java fern ), Taxiphyllum barbieri (‘Java’ moss ) or Anubias spp. that grow well in low light conditions, will benefit the fish, and when attached to driftwood or other tank furniture will provide additional shade for the fish. Dario Botia Loaches will easily adapt to and should only be introduced to stable, biologically mature aquariums. Weekly water changes of 30-50% tank volume should be considered routine maintenance. The breeding habits of this species is not known and no successful captive breeding has yet been recorded by any tropical fish keeping enthusiast. The Dario Botia Loach is a grazer and requires small amounts of food several times a day. Young Dario Botia Loaches will eat most high quality commercially prepared foods but older fish may be more finicky. Feed them a varied diet of freeze dried bloodworms , brine shrimp and a quality flake or pellet food. They relish snails and will feast on them with gusto. When available for purchase, they are usually 1-3/4″ to 2-1/2″ in size.